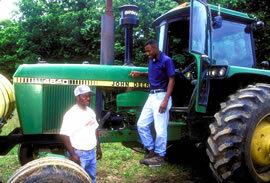 Two African American farmers with a John Deere tractor. Photo Courtesy of the United States Department of Agriculture. The number of African-American farmers has declined at a rate three times greater than that of white farmers. African-Americans now make up less than 1% of the nation’s farmers. For years, African-American farmers said that discrimination against them in loan programs by the United States Department of Agriculture (USDA) was a major reason for the disappearance of African-American farmers. Without easy access to the low interest government farm loans that white farmers received, many African-American farmers were forced out of business. In 1997, African American farmers filed a class action lawsuit against the USDA demanding compensation from the government. The USDA admitted that there had been discrimination against African-American farmers and offered them cash payments and remission of any loans they had. Click on PICTURES below to see a photo of an African American man tending his crops. Click on CHARTS and MAPS below for additional information about minority farm workers.